Be the first to share your favorite memory, photo or story of Talmage. This memorial page is dedicated for family, friends and future generations to celebrate the life of their loved one. 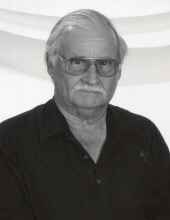 Talmage Lawson Harrison, 81, passed away peacefully on Saturday, March 16, 2019 at his home surrounded by his family. Talmage was born in Wayne County on July 8, 1937 to the late John Lawson Harrison and Abia Worrell Harrison. He served for 33 years as a foreman with the United States Civil Service at Seymour Johnson Air Force Base. Talmage lived a life of dedication to his family, church, and community where he was instrumental in the operations of the Saulston Community Water System. Talmage was also a faithful member of Saulston United Methodist Church where he served in various capacities throughout his life. Talmage was a hard-working man, which was the theme of his life, he lived to work. He was the kind of man who was loyal to his family, who took great pride in caring and providing for them. Talmage will be missed but will be greatly remembered. The family will greet friends on Monday, March 18, 2019 from 6:00 – 7:00 p.m. in the fellowship hall of Saulston United Methodist Church followed by a service to celebrate Talmage’s life at 7:00 p.m. in the sanctuary with Rev. Howard James and Rev. Michael Parks officiating. The family will also greet friends immediately following the service in the fellowship hall and other times at his home. Interment will be on Tuesday, March 19, 2019 at 11:00 a.m. in Wayne Memorial Park. Talmage is survived by his wife of 58 years, Barbara Jean Roberts Harrison; sons, Talmadge Matthew Harrison and wife Lynn of Goldsboro and Jonathan Roy Harrison; sister, Diane H. Hill and husband Randy of Snow Hill; brothers, Wayne Harrison and wife Shelby of Pikeville and Marcellus Harrison and wife Janice of Goldsboro. He is also survived by his beloved grandchildren, Matthew Ryan Harrison, Logan Renee Harrison and Jenna Nicole Harrison. In addition to his parents, he was preceded in death by his brother, Douglas Harrison. Flowers are welcome or memorials may be given in his memory to Saulston United Methodist Church, 4620 Wayne Memorial Drive, Goldsboro, NC 27534. To send flowers or a remembrance gift to the family of Talmage Lawson Harrison, please visit our Tribute Store. "Email Address" would like to share the life celebration of Talmage Lawson Harrison. Click on the "link" to go to share a favorite memory or leave a condolence message for the family.